Since I arrived with negative two minutes to spare before the lights went down and the actors of Broadway show Fun Home got going, I had no time to open the playbill. I know a bit about what’s on the Broadway circuit thanks to working at Dance Media. But, thanks to working at Dance Media, the shows without dance ensembles largely escape my notice. (Not that Fun Home didn’t have any dance. I’ll single out—hopefully in an utterly non-creepy way—Zell Steele Marrow’s hips. Kid’s got rhythm. Also a great stage name.) If you intend to be as oblivious as I was when you go see last year’s Tony-Award winner for Best Musical, stop reading here. SPOILERS from here on out. Was that a big enough hint? 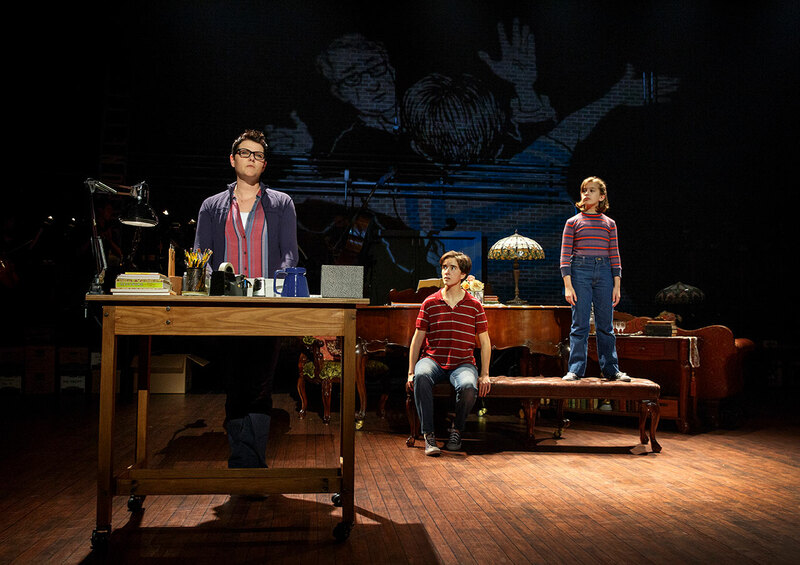 The “Fun” in Fun Home is short for funeral. Yet that plot detail provides less conflict than I thought it would. There are three Alisons. There’s Young Alison, whose tries desperately to connect with an overbearing and simultaneously disconnected father Bruce (Michael Cerveris), who is a funeral home director, English teacher, antique furniture enthusiast and suppressed homosexual. There’s Middle Alison (Emily Skeggs), who—thanks to the lesbian themes in Colette’s literature and a certain fellow undergrad—discovers her own sexuality and comes out to her family while she’s away at college. And there’s 40-something Alison (Beth Malone), a cartoonist, who frames the whole musical with her retrospect: her struggle to understand her relationship with her dad and attempt to record it on paper. Poignantly, she captions, “my beginning was the start to his ending.” Four months after Alison comes out to her parents, Bruce commits suicide by stepping in front of at truck. The show does a remarkable job plumbing the depths of the complex father character, a role that won Cerveris a Tony for Best Actor. Every actor gave a moving performance. The mother, with her standout song about a life wasted on an oppressive marriage, had me crying for all the women who have, do and will live that experience. I’d do the show a disservice by trying to summarize. (Alison Bechdel—author of the memoir that the show is adapted from and, yes, creator of the Bechdel Test—tells it all better). But my partner and I left with the same thought: the musical was dark; it dealt with a family’s dysfunction, pain and tragedy. And we’re glad it did. My family doesn’t like watching something that they know will be sad. I can understand avoiding that unpleasantness in favor of shows that entertain—in the buttered popcorn, light-hearted, blockbuster sense of the word. But if tragic events and harmful relationships aren’t explored in film, literature and theater, how can we possibly imagine, accept, or deal with their effects on our lives? Where might the healing begin? In a psychologist’s office, maybe. But when people don’t have/recognize that as a support system—when dark and complex is close to home and the feelings that arise aren’t given a voice or an outlet…Maybe that’s when men drive themselves to suicide suppressing their homosexuality. Maybe that’s when women give their lives over to marriages full of abuse and ennui. Maybe that’s when the young girls in such “fun homes” don’t escape—don’t grow up to be lesbian cartoonists who find a way to fit trauma into their stories rather than give up ever drawing the next scene, writing the next chapter. Maybe that’s when Alison grows up striving for the shoulds that drove Bruce to stand on that highway. Maybe that’s when she ignores the parts of her that are confusing and challenging to admit or explore. That’s when disassociates from subject matter that’s “depressing” in favor of the lighthearted. The mask. Maybe that’s when she ignores the image of herself in the pages of lesbian literature. Maybe that’s when she doesn’t pick up literature at all. Maybe that’s when she grows up to be just like her father. Previous Hiplet: Hip-Hop-Ballet or Neither? Next The Mirror: Friend or Foe?